Car manufacturers occasionally dip a toe into the world of two wheels. It’s usually in the form of an expensive bicycle designed to be strapped to the back of a giant SUV, and bought by middle-aged businessmen. But that hasn’t stopped petrolhead designers from daydreaming about radical motorcycles bearing lustworthy badges. So for this week’s Top 5, we’re taking a sideways look at five concept motorcycles that wear the logo of a high-end carmaker. First up is Porsche, with a very strange concept indeed. Porsche Design Alternative Motorrad Konzept Porsche is well known for helping Harley-Davidson on the engineering front, notably with the VR1000 racer and the Revolution engine that debuted in the V-Rod. Less well known is this 1978 concept motorcycle based on a Yamaha SR500. As with most carmaker-derived concepts, it’s high on style and low on practicality—those enclosed wheels would never work, for starters. 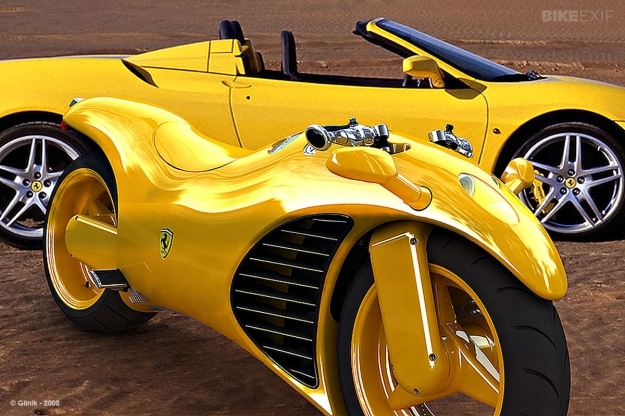 Amir Glinik’s ‘Ferrari motorycle’ If Ferrari made a motorcycle, what would it look like? Designer Amir Glinik decided to find out, and released an amazing set of 3D computer renderings. 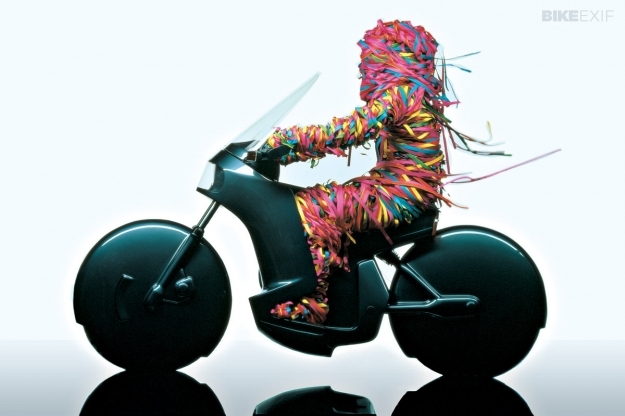 Five years ago the images took the interwebs by storm, proving that Maranello and motorcycles are an intoxicating (if unauthorized) mix. These days, Glinik still operates in the virtual world—but sticks to beautifully detailed computer models of vintage Harley-Davidsons. Lamborghini Design Straddling the borderline between concept and reality is this French project from the mid-1980s. 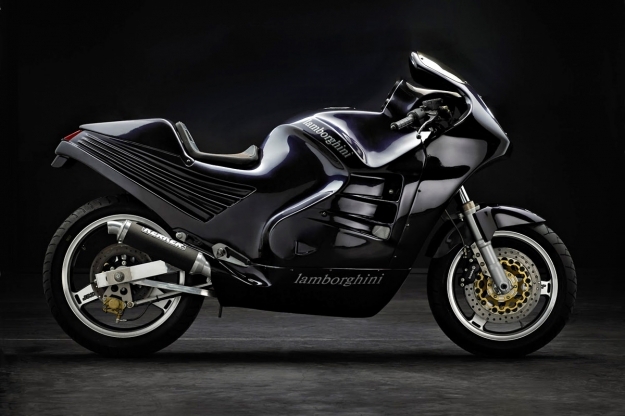 In those days, the Mimran brothers owned Lamborghini, and Patrick Mimran commissioned Boxer Design and frame specialist Claude Fior to create a bona-fide Lamborghini motorcycle. It had an aluminum frame and a Kawasaki engine, and depending on whom you ask, between five and forty were built. Photo: Guerry & Prat Images, via Southsiders MC. 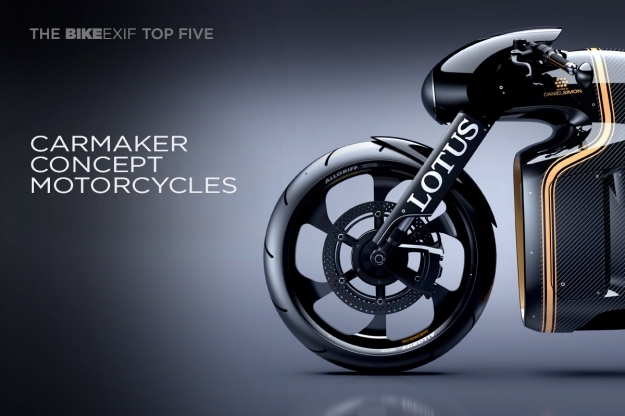 Lotus C-01 The name and logo are familiar, but the background to the Lotus motorcycle is murky. Today, Lotus is owned by the Malaysian car company Proton, which has licensed the naming rights to a German auto racing team, Kodewa. Interest in the Daniel Simon-designed power cruiser has been extraordinary, and we’re told that there are road-going prototypes running with a 200bhp version of the KTM RC8 engine. Lauge Jensen ‘Viking’ The Danish company Lauge Jensen makes improbably expensive motorcycles that will never, ever grace the pages of Bike EXIF. This concept is a step in the right direction though, and comes from car designer Henrik Fisker—best known for the Aston Martin DB9 and the ill-fated Fisker Karma electric sports sedan. 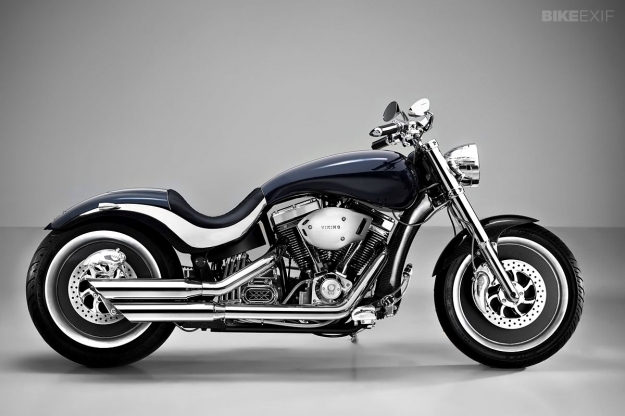 It’s a sterling example of classic cruiser design, and powered by a Harley-derived S&S V-twin pushing out 100bhp. The Viking will top 130 mph but also meets the impending Euro IV emissions regulations. The price will be around $50,000—and I’m betting there will be no shortage of buyers. 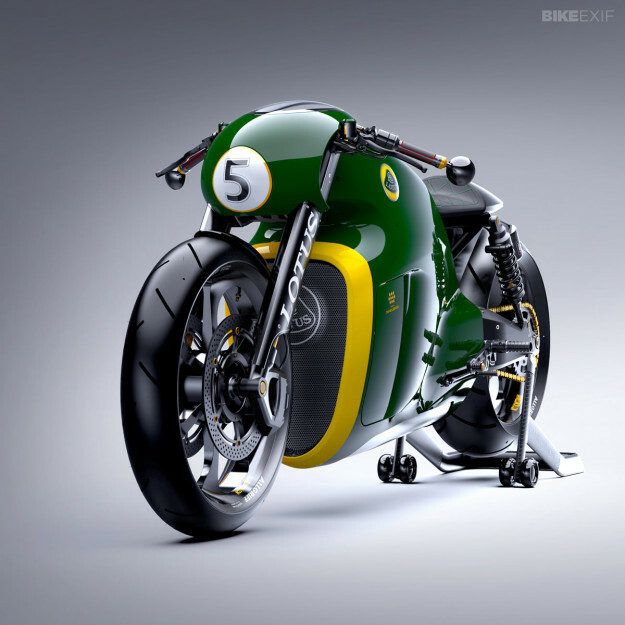 Expect to see this particular concept motorcycle go into small-scale production soon. Last week’s Top 5 covered the Yamaha SR400.